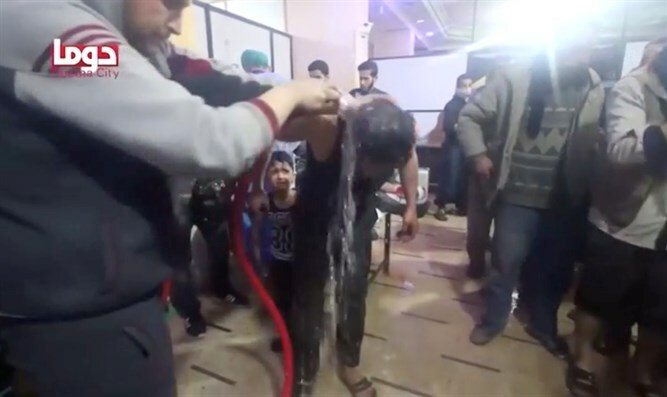 Initial assessment by U.S. authorities is that chemical weapons were indeed used in attack on rebel-held town of Douma. The assessment by U.S. authorities is that chemical weapons were indeed used in a besieged rebel-held town in Syria, U.S. government sources said on Sunday, according to the Reuters news agency. At the same time, the sources said the details of the attack are still being evaluated. The determination was made with some degree of confidence, said the sources, who stopped short of assigning blame for Saturday’s attack, which medical aid groups said killed dozens of people in the town of Douma. Meanwhile on Sunday night, French President Emmanuel Macron accused Damascus of “chemical attacks” against civilians in Douma in a call with U.S. President Donald Trump. It added that Macron and Trump shared information “confirming” the use of chemical weapons and would coordinate their efforts at a meeting of the UN Security Council in New York on Monday. The attack involved Syrian government warplanes, and according to monitoring groups, included the use of sarin nerve gas. Casualty reports run as high as 150 dead with 1,000 more injured from the suspected chemical weapon attack. Earlier on Sunday, U.S. President Donald Trump warned the Syrian government it would pay a “big price” for the suspected chemical weapons attack. “Many dead, including women and children, in mindless CHEMICAL attack in Syria,” tweeted Trump. The president also singled out Syria’s allies, Iran and Russia, for criticism, and made explicit mention of Russian President Vladimir Putin.